“I purchased these at an estate sale and neither will power up. 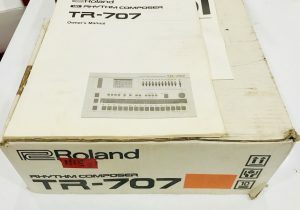 The TR-707 is in very good cosmetic condition – maybe some dust. The graphics in the window are blurred and the battery cover is missing. 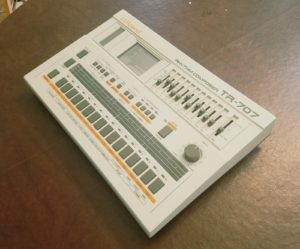 “Up for sale is a used Roland TR-707. Has issues and is heavily used but has been a workhorse for years and years. Blue tape is to keep batteries in so the memory doesn’t erase itself. Issues: Both the Headphones and R (Mono) L outputs have a static sound that is noticeable when drum sounds aren’t engaged, and engaged but static level drops down once drums are playing. The individual outs for each sound work (except Ride, which works only on the Headphones and R/L outputs) with that static noise gone, and that is how i’ve used it for years. I have programmed beats on it for years, but never used the midi or song parts of it, but would assume it works. Usually just recorded a beat and switched between patterns while jamming, and it saved just fine. No power supply for this one — have always used a generic 9volt supply, which is easy to find. 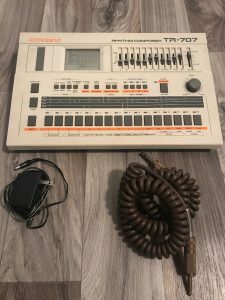 “Up for auction is a vintage Roland TR-707 in excellent shape. There are light scuffs on the front panel and scratches on the bottom panel. The front panel was recently cleaned of dirt and grime. Faders and tempo potentiometer were recently cleaned as well and work great. The battery cover on the back is missing, but there is no corrosion on the leads from busted batteries. 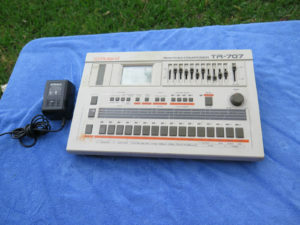 “Here is a Roland TR-707 for sale. Please note, it’s not currently working. It is currently not powering up. It may be an easy fix, I don’t know. I purchased it at an estate sale. They did not have the original power supply for it so I couldn’t check if it worked. I took a risk and bought it anyway only to find that when I applied a universal 12 volt power supply upon bringing it home it would not power on. Cosmetically, the unit is in pretty good condition. All of the buttons, sliders and the tempo knob are in place and in good order. The upper case has a few small scuffs and there’s a green mark by the bass drum buttons. 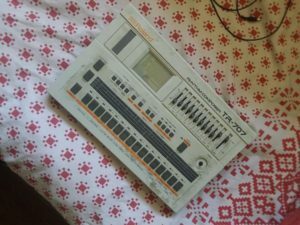 “Roland TR-707 for parts or (hopefully) repair. Serial number 493400. The unit powers on and the sequencer seems to function fine — able to load and edit patterns, but all sounds other than the cymbal and ride are quite glitchy — sort of a white noise/distorted sound with a very slight hint of the timbre that is supposed to play. Happy to provide sound samples upon request. The power input was rewired — which was how I purchased it 12 years ago, so some of the issues may simply stem from improper power being supplied to the board. It did work properly for several years, but hasn’t in quite some time. Battery power does not work; MIDI and sync are untested. 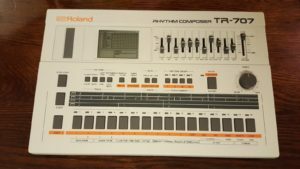 “I am selling my Roland TR 707. THIS IS IN FANTASTIC CONDITION, SHOWING TYPICAL HANDLING / USAGE WEAR. 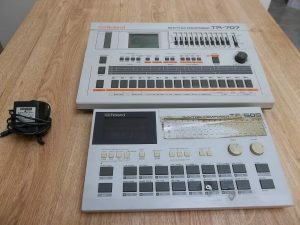 “The Roland TR-707 is a ClassicDrum machine in great shape . Lots of fun with old school beats . 10 separate studio outputs plusMono/Stereo , headphone /midi , start/stop. “Classic, drum machine with unique, vintage analog sounds that you can only get from a machine like this. Perfect for the collector, vintage instrument enthusiast or the producer looking for that “dirty” drum sound. 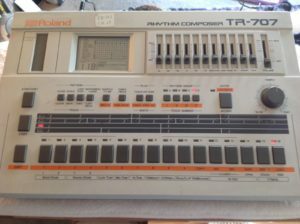 “Featured in this NO RESERVE auction is a fine example of the Iconic ROLAND TR-707 Rhythm Composer DRUM MACHINE. Included with this Vintage Drum Machine is the original ROLAND AC Adaptor. 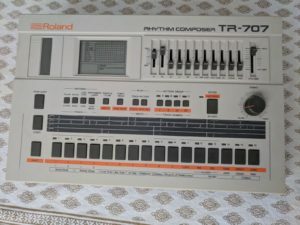 “Excellent functional and cosmetic condition Roland Tr 707 vintage drum machine. 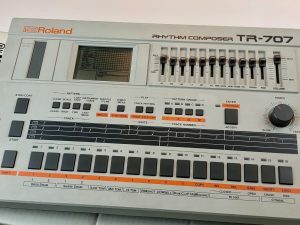 An integral part of the Roland TR Series. Sound of the machine is classic, and with ext 1/4″ outputs for each instrument it is without a doubt a more flexible and functional sounding machine than the new TR 8 models . “In Very Good Condition and Working Condition for its age.